It’s Day 11 of 31 Days of Horror, and we’re talking about the 1954 monster classic Gojira!! It was later “Americanized” and changed into Godzilla, King of the Monsters! by adding in Raymond Burr and rearranging the plot structure and order of the film, but Gojira is the unaltered Japanese original. It wasn’t even available in North America until over 50 years after it was released, but it happens to be the superior version in many aspects. Godzilla has remained popular throughout the years, what with the recent Gareth Edwards version and the new Shin Godzilla, so it’s hard to imagine that there’s many of you out there that don’t know the plot, but here’s a synopsis anyway: A Japanese ship suddenly goes missing, and then another one as well. Japanese Authorities are baffled until they realize that the ships are actually being destroyed by a giant radioactive dinosaur from the Jurassic Period who has been brought to life by atomic bomb testing. This dinosaur, Gojira / Godzilla (which, I guess, are used interchangeably?? ), soon begins to wreak havoc on Japan, and the military struggles to come up with a solution. Professor Yamane wants to take a more scientific approach and observe Godzilla instead of killing him. He wants to learn everything about this creature (especially the radioactive bit) even at the expense of many more people dying. Meanwhile, Navy man Hideto Ogato thinks they should defeat Godzilla by any means necessary. He also wants to marry Yamane’s daughter, Emiko, but when he begins to bring it up with Yamane, the two get in a huge argument and nothing is resolved. The whole situation looks hopeless, and after a few different attempts by the military to destroy him, it seems Godzilla is unstoppable. It turns out, however, that Dr. Serizawa (with whom Emiko is betrothed) actually has an experimental device that could eliminate Godzilla once-and-for-all, but he doesn’t want to use it for fear that it would be used to harm people after Godzilla is defeated. This is the part of the movie that intrigued me the most. 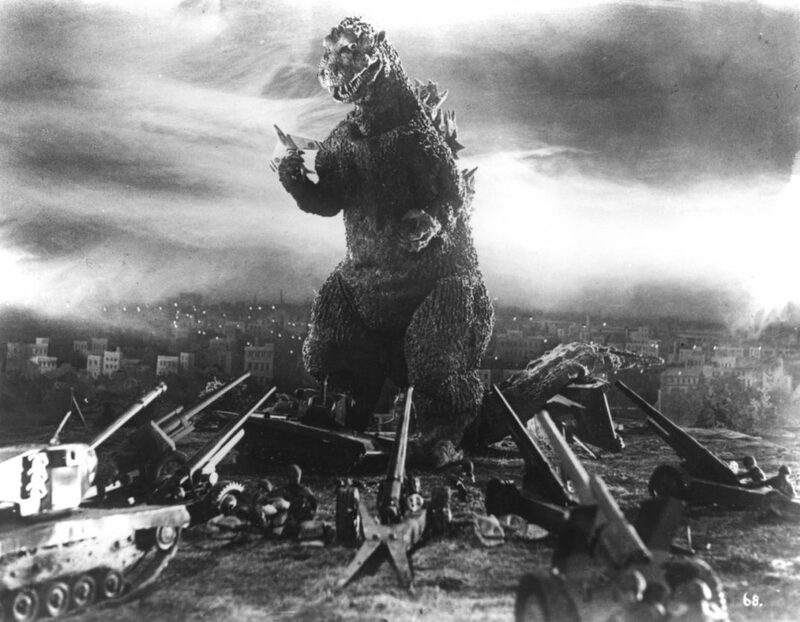 Take a step back for a second, and look at what Godzilla represents: The consequences of nuclear fallout in a country that, less than a decade earlier, had seen first hand just what an atomic bomb could do. Dr. Serizawa’s reluctance to use a weapon, even to save his own country, arguably sounds like a critique of the United States (specifically President Harry Truman) and it raises the question: Does the end ever justify the means? Ultimately, in this movie, Serizawa figures out a way to defeat Godzilla and keep others from using his weapon again by sacrificing himself, but that also has strong implications and raises some other questions (Namely: Why couldn’t his device be remotely detonated??). Professor Yamane even gives a speech about it in the closing lines of the film, ominously warning about using atomic bombs to create other Godzilla monsters. It’s brilliantly intriguing and philosophical at the same time without really offering up a good answer. Maybe there isn’t one? And this is all why I think believe Gojira is a better film than the American version. That movie stripped away most of the atomic bomb implications and focused more on the monster / creature feature aspects. It also dubbed over many of the original Japanese actors, but very inconsistently because sometimes they’re dubbed in English and sometimes they’re subtitled while speaking Japanese. It’s a strange blend. So, I would skip that one (assuming you haven’t already seen it) and seek this one out. It’s a gem of a movie with a message that still resonates today. It’s Day 12 tomorrow and Kelley will be reviewing Tarantula, so be sure to come back and check it out! !